This month we bring you additional images of materials taken from the Louisiana Division's Rare Vertical File, a collection of ephemera dating from ca. 1930 and earlier. The collection is arranged by subject or type of material, and this month we've chosen items from the "Invitations" category. 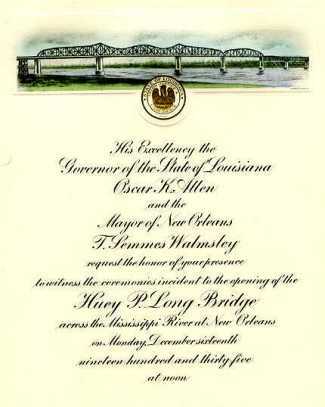 The invitations represented commemorate (and document) not only important historical events like the centennials of the Louisiana Purchase and Louisiana statehood but also private, everyday occurances like weddings, high school graduations, political and fraternal meetings, receptions and commercial open houses--all of which, taken together, contribute to our understanding of the life of the city and its people. and is available to registered Louisiana Division researchers. Contact one of the archivists for further information. 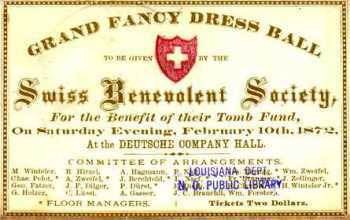 The Swiss Benevolent Society was one of dozens of such mutual aid organizations that existed in the 19th and early 20th centuries to provide medical services, health and burial benefits, and other sorts of aid to their members. This ball, held in 1872 at the Deutsche Hall (Bienville, corner Exchange Place), benefited the society's "tomb fund"; we don't know how much the "grand fancy dress ball" raised, but we do know that the Swiss Society did build a tomb, which stands today in Greenwood Cemetery. 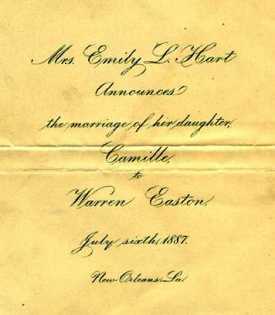 This next invitation records a private event--a marriage--but it is the marriage of a public man, Warren Easton, who was to serve for more than 20 years as the Superintendent of the New Orleans Public Schools. We're told that during his tenure, Mr. Easton "knew his 800 teachers personally, could call them by name and locate the school and grade of each." Today, one of the city's high schools bears his name. 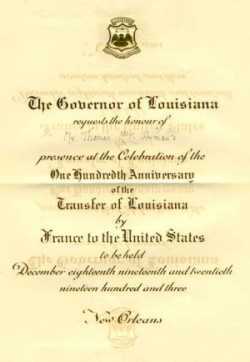 The city of New Orleans' Louisiana Purchase centennial was celebrated with great pomp and circumstance from December 18 to December 20, 1903. The festivities included an international Naval review on the River; a historical ball and a gala performance (with allegorical tableaux as a finale) at the French Opera House; receptions for dignitaries given by the Mayor and the City Council; speeches, proclamations and military reviews at the Cabildo; and a "grand pontifical mass" at St. Louis Cathedral. It must have been quite a weekend. The two hundredth anniversary of this event is just five years away. Sophie B. Wright (1866-1912) was the founder of the Home Institute, a school for young ladies, which she soon expanded into a night school for male students. She dedicated her life to educating and improving the quality of life for New Orleans' poor and infirm. Today, a public square and a middle school are named in her honor. 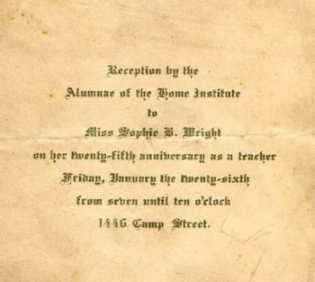 We're not sure of the year when the Home Institute honored her 25th anniversary as a teacher since although she founded her school in 1883, she began to teach even earlier. 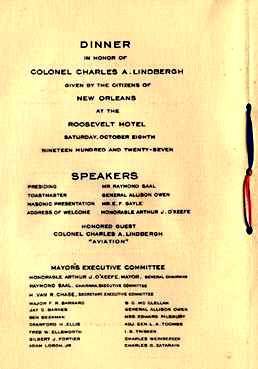 In 1912, the city once again celebrated a landmark anniversary--this time the centennial of statehood--with festivities similar to those enacted in the 1903 Louisiana Purchase celebrations, including receptions, dignitaries (among them, Secretary of State Philander C. Knox), a big military parade, and a gala banquet in the Gold Room of the Hotel Grunewald. But perhaps the most important--and certainly the most lasting--event of that celebration was the formal opening of the Louisiana State Museum, housed in the Cabildo and the Presbytere. Visit the State Museum's web page! 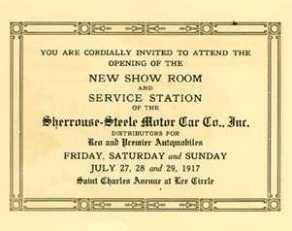 The next invitation gives us a glimpse of an event on a much smaller scale--the opening of a new car dealership at Lee Circle in 1917. Sherrouse-Steele sold Reo and Premier automobiles (Does anybody remember those names??? ), and invited the city in for a three-day open house to view their new space (and, ideally, to buy a few cars). 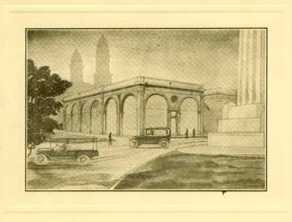 "We decided that when we erected a building we should erect one worthy of the Reo and the Premier," said Mr. Sherrouse to the Times-Picayune, "and one worthy of the importance which the motor car industry is assuming in this country." The Picayune complimented the appearance and furnishings of the new building and noted that it was "an attractive improvement for Lee Circle." Ironically enough, this building stood next door to New Orleans Public Library's original Main Library; today, both buildings are gone. 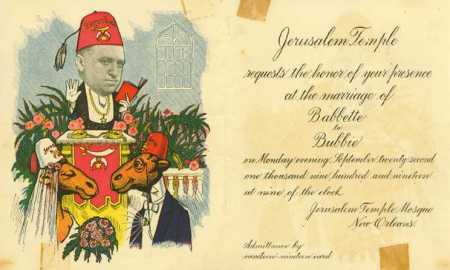 Another wedding invitation--but we're afraid only the Shriners could tell you what this interesting ceremony was all about! Babbette and Bubbie tied the knot at the old Jerusalem Temple at 1137 St. Charles Avenue, now the home of the Way Jesus Christ Missionary Church. Presiding over the ceremony may be Charles Weinberger, who was the 1919 Illustrious Potentate of Jerusalem Temple and was instrumental in getting the Temple built. 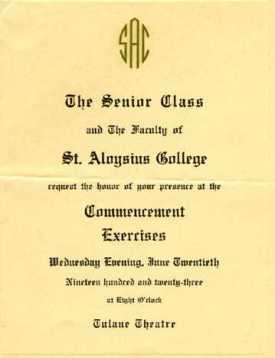 St. Aloysius College (later St. Aloysius High School) can trace its origins all the way back to 1869, but New Orleanians today remember the boys' school run by the Brothers of the Sacred Heart which operated at the corner of Rampart Street and Esplanade Avenue. In 1969, the school merged with Cor Jesu High School, a second Sacred Heart Brothers school which had opened on Elysian Fields in 1954, and became Brother Martin High School. America's hero, Charles Lindbergh, flew the Spirit of St. Louis into Alvin Callender Field on October 8, 1927, less than five months after his triumphant trans-Atlantic flight. Greeted by the Mayor , city officials, naval officers, and an official reception committee, he motorcaded to Tulane Stadium, where 15,000 school children waited for him in the rain. After a brief address, he paraded through town to the Roosevelt Hotel. "Throngs surpassing in spirit the Carnival crowds lined the streets. . . , " the Picayune reported, "and from his seat on the tonneau of a touring car, unmindful of the pelting rain, the Lone Eagle looked down into waves upon waves of shouting men, women and children." 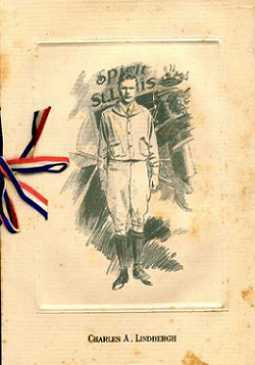 That night, 700 New Orleanians gathered at the Roosevelt to honor him at a banquet--the program of which is seen here. 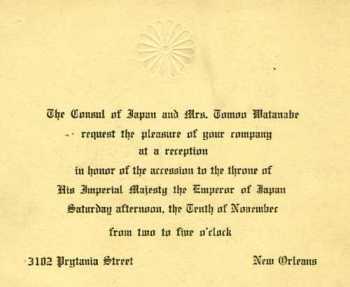 This invitation marks the beginnings of the reign of Japan's emperor Hirohito, who ascended the Chrysanthemum Throne in 1928. The attendees of this banquet could have had no idea of Hirohito's future role as the enemy of the United States. In its day, the Huey P. Long Bridge was the longest railroad bridge in the world. Designed by engineering firm Modjeski, Masters, and Case, and built at a cost of $1,300,000, the "Huey" provided New Orleans with its first easy access (other than the ferry) to the West Bank. 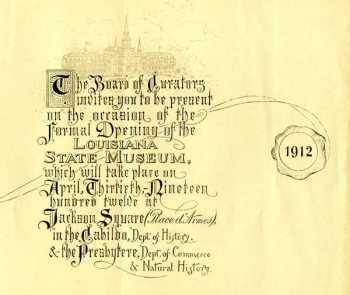 This invitation marks its dedication on December 16, 1935. This invitation is the only item in this month's gallery which is not from the Rare Vertical File. 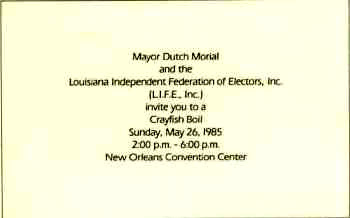 Instead, this invitation to a crawfish boil for Mayor Dutch Morial's "LIFE" political organization is housed in the City Archives' "Official Vertical File," a collection of ephemera and other materials relating to municipal government. 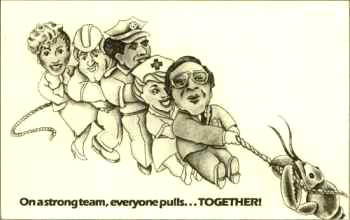 The LIFE organization continues to this day to provide support for New Orleans politicians, including Dutch's son, our current mayor Marc Morial--and the New Orleans Convention Center now bears the name of Ernest N. Morial.